For instance, the Quality Department shared the story of two teams who took innovative approaches to improving patient care across the state. Readers also learned about two U-M psychiatry fellows who are doing life-saving mental health research in Ghana. 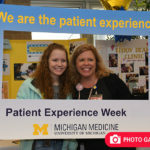 On top of that, faculty and staff were given a look back at the “Celebration of Humanity” at the Frankel Cardiovascular Center; HITS rolled out a new initiative to protect individual and organizational data; and the organization announced upcoming town halls where employees can give their input on Michigan Medicine’s core values. At MedSport, team members were often committing hours to rolling up reusable elastic bandages. It was valuable time that could have been devoted to patient care. Meanwhile, at MidMichigan Health, the organization was noticing a large percentage of high-acuity patients being transferred out of their system. Fortunately, two teams stepped up to solve those issues, enhancing the experience for patients and families. Click here to learn more about both projects, which will be featured at next week’s Quality Month event! Heidi Burns, M.D., and Nakita Natala, M.D., are two U-M Medical School fellows currently carrying out mental health research in Ghana. The pair is there with the help of a grant from the Fogarty Center, which wants to help even more Michigan Medicine community members carry out vital research in developing countries. Click through for more on Burns and Natala, and find out how you can apply for the next round of Fogarty Center funding! Recently, the Frankel Cardiovascular Center held a daylong event featuring music, art, dance and more. 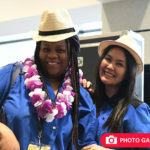 It was all designed to celebrate the unique backgrounds and cultures of FCVC employees. Check out a full recap of the event and see if a similar program could improve the diversity, equity and inclusion efforts in your area! 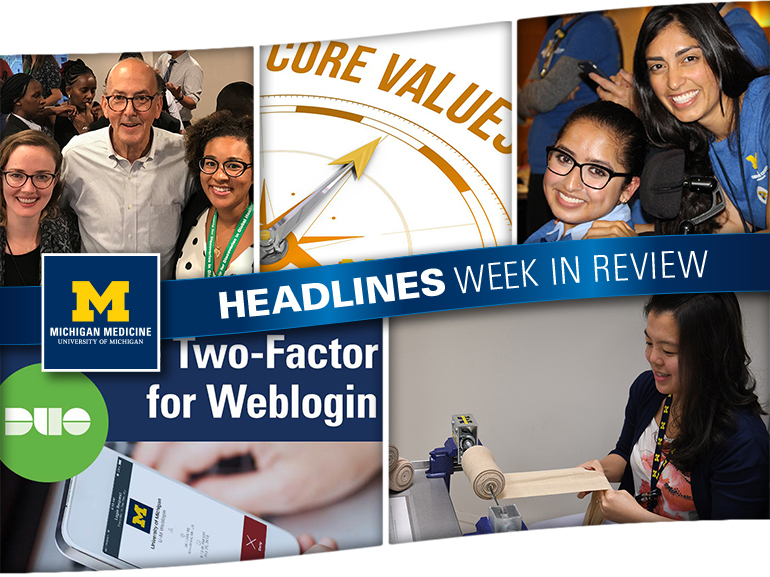 Beginning this week, all members of the Michigan Medicine community must now utilize Duo two-factor authentication at Weblogin. This extra level of security will help protect personal data — such as direct deposit and W-2 forms — as well as vital institutional information. To learn more Duo and how to enroll, click here. 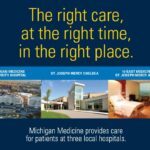 Michigan Medicine recently announced its new mission statement and three core values: integrity, caring and collaboration. The organization is set to adopt two more values — and it wants to hear from you! Learn more about upcoming town hall meetings designed for employees to provide feedback to leadership on the final two core values.